The warm humid climate of tropical rainforests provides the perfect environment for a huge variation of amazing plant life. In this section of Tropical Rainforest Facts you will find interesting information about the flora of these regions and how this vegetation survives. Below you will find a list of general rainforest plant facts and facts about how these plants adapt for survival in these regions; explore the other pages of this section for more specific information. Click here for a great selection of Amazon.com books about tropical rainforests. Two thirds of the earths plant species are found in tropical rainforests. Rainforest plants are used to produce numerous products. These products include fruit, coffee, cacao (for making chocolate), rubber, dyes, rice, wood, and gums. Many of the medicines we use derive some of their ingredients from rainforest plants. Many of these plants are used in cancer fighting drugs. Rainforest vegetation is being destroyed by humans at an alarming rate. Land is being cleared due to logging, ranching, mining, and for human settlements. The plants of the rainforest are involved in the gas exchanges which provide a great deal of the worlds oxygen supply by recycling carbon dioxide into oxygen. Plants need water to survive; however in the rainforest the problem is not that there is not enough water but that there is often too much. Plants that live in the rainforest must be able to survive in areas that receive a lot of rain and may even flood. Many plants have waxy leaves that help repel the rain. The leaves of many trees have a drip tip which is designed to have rain run off of them quickly. Plants need sunlight to survive; the thick vegetation of the upper layers of the forest allows little sunlight to reach the rainforest floor. 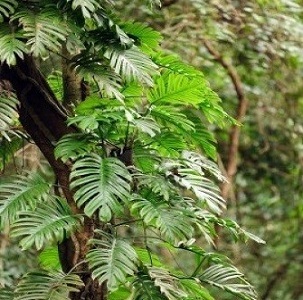 Rainforest plants must either adapt to living with little sunlight under the forest canopy or grow quickly and find ways of reaching the sunlight above the canopy. For example vines quickly grow up the trunks and branches of trees to reach sunlight. Some plants such as the Strangler Fig actually start life high in the canopy, thus capturing needed sunlight immediately. They slowly grow down to the forest floor with the roots eventually reaching the soil. The soil in most rainforest is very poor and lacking in nutrients. The little nutrients available are found near the top of the soil and the deeper you get the less nutrients are available. To capture the richer nutrients of the top soil most rainforest trees have shallow roots. These trees have developed buttress roots. These roots grow out from the trunk well above ground level (often 15 feet above ground level) providing the support needed for the tree while capturing the nutrients in the shallow soil. The high humidity and plentiful rain of the rainforest enable some plants to actually grow without soil. These types of plants are called air plants or aerial plants. They get nutrients from plant debris and bird droppings that land on their roots and are not dependent on the poor soil of the forest.